Just a note for those who may be interested: I've started a new blog to cater to my non-gaming-related hoots and squawks. I used to do that sort of thing at Livejournal, but I find blogger's image-handling to be more congenial, so I've moved house. Over on Jeff Rients' gaming blog he has just been talking about determining initiative, and it sparked an idea in my overheated game-brainz. As may have become apparent, I really do love the multiplicity of die-types used in D&D, and I like to use them all wherever possible. Rolling for initiative in combat seems like an ideal candidate for expanding the dice pool in a way similar to my idea for the surprise roll, and the type of die rolled for initiative would depend on the character's (or monster's — we'll get to that) DEX score. There are pros and cons for this system. Con: It would require individual, rather than group initiative, which can slow things down a bit at the table, and in a large fight it can be easy for somebody to miss their turn, evoking howls of outrage and demands to rewind the action so that they don't have to bear the penalty of their own egregious lack of attention. However, we used individual initiative quite successfully in our D&D3e days, using my Patent DeLuxe Initiative Board and little slips of card with the character's name written on it. A similar board could be used for this system, but it would be smaller, only having to go up to 20 (unless one included a d30). It allows for characters (and monsters) with multiple attack routines to see just when they come in — I'd suggest 5 spaces down the chart from their initial initiative placing, with a minimum of 1. Con: It would require that all monsters would need DEX scores. That could mean a bit of work for the GM rolling them individually, or else it could mean that he or she just use the DEX scores listed in the 3e monster descriptions in all the vast number of 3e monster books he or she already owns and are just sitting there on the shelf doing nothing. Pro: It opens out the initiative system to accommodate quick, high-DEX characters without making them invariably the first to get an attack routine. Even if you're throwing a d20 and your opponent a d3, there's always the chance that you might throw a 1. I like that, because when it happens the groans feed the darkness in my bitter, twisted heart. Pro: It gives the players the illusion that they have some sort of individual control over events. It's so touching that they think that. Pro: It uses all the funny shaped dice. What's not to like about that? The forest-base is shown here with some Heroics & Ros WWII British infantry and a GHQ A9 Cruiser tank. I have a couple of alders growing in the front of my section. They're not among my favourite trees, but they do have one use. Making teensy-tiny forests to go along with teensy-tiny toy soldiers. They produce small cones, and when they're seeding, these cones dry up and open out. 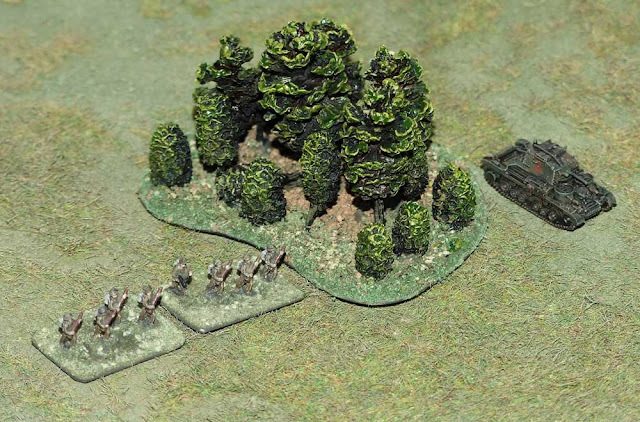 They range in size from a couple of centimetres in length down to about 5 or 6mm, and they're conveniently bushy-looking for my wargames-scenery purposes. 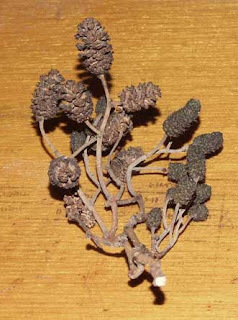 The picture to the right shows what they look like straight off the tree, still attached to their twig, but the cones will eventually drop off and lie all over the ground, a savagely spiky trap for the bare-footed. I snipped some, of varying sizes, off their twigs and hot-glued them to a sort of kidney-shaped 0.5mm galvanized steel base. I sealed the lot with matte-black spray paint, added a bit of flock around the base, and loosely painted the cones in a couple of shades of yellowish-green. The individual base shown above took me about half an hour from start to finish, but if you were production-lining them I suspect they would average out to more like ten minutes each. My aim is to have a multitude of small forest modules that can be rearranged into as large or as small a forest as is required, rather than using larger, less flexible modules. 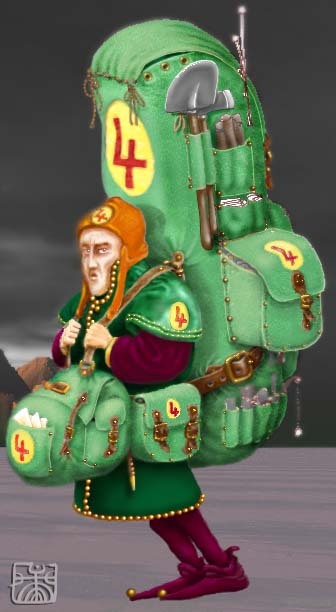 When I was playing my favourite old character Fnord the Pretty Gosh-Darned Nifty, over time I gradually developed a pretty comprehensive equipment list for him. The whole lot together comes to just under a hundred kilos (about 225 pounds), and being fairly strong he could just stagger along under the weight of it all bundled up, but quite apart from the weight, it made a big bundle and generally I hired bearers and/or mules to carry it. This doesn't include stuff like armour or weapons, or non-adventuring stuff like his teddy-bear or ukelele. Or his skunk (don't ask, because I don't remember). When I eventually managed to get my greedy hands on a Portable Hole, things got a lot more straight-forward. Man, those things are incredibly useful. Every single item on this list saw use, one way or another, many of them frequently. This is a bayou in Louisiana, in the southern USA. 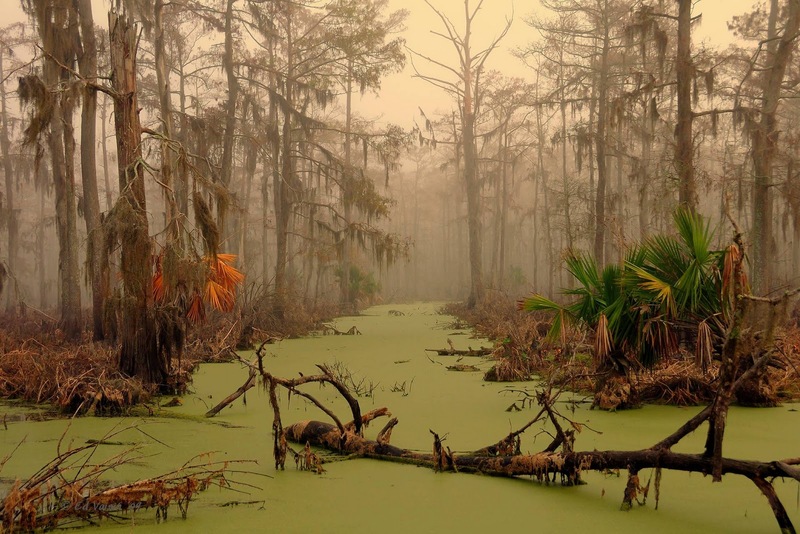 I'm fond of using swamps in my games; they start with a high level of creepiness, and only get worse when you start adding mist and drizzle and nasties like huge rotting undead alligator zombies. And you just know, if you happen upon any folk actually living in there, at best they're going to turn out to be Deliverance-style inbred rustics who would just love to have you for dinner — stewed or fricasseed, whichever. I just love watching a party, stranded on a squishy, oozing island, trying to figure out how to get to dry land without actually getting into the water with all the things. Is it wrong of me to enjoy their consternation so much? I don't think so. 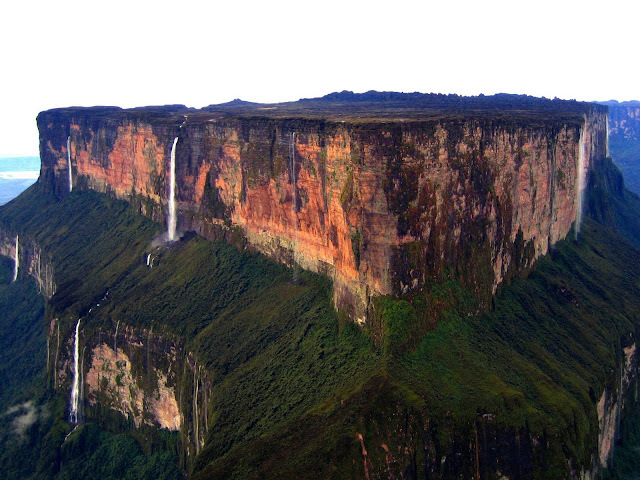 Scenery: Just climb up there and get the thing, will you? Got rope? Lots and lots and lots of rope? Angel Barracks is a web-forum, new to me, dealing with 6mm (1:300-1:285 scale) modelling and wargaming. I'm in the process of running an AD&D adventure from an ancient edition of Dragon (#63, to be precise), minimally converted to fit my bastardized Swords & Wizardry variant. It's been very useful in revealing to me just which game-mechanics tinkering is actually worth the trouble, and which can be discarded. 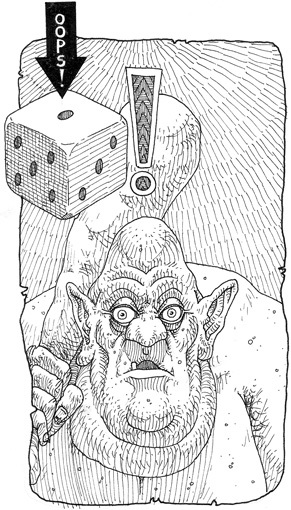 I've been using the very basic surprise mechanic that D&D and AD&D started with: 1d6, with most characters or critters being surprised if they roll a 1 or 2 (roughly 33% chance of surprise). It's simple, which is good, but it lacks granularity: at best, assuming your character can be surprised only on a 1, the best possible chance to be surprised is still about 17% — pretty high really. It doesn't really accommodate the preternatural alertness of fantasy tropes like Conanoid barbarians or Tolkienoid elves. I like the idea of a single die-roll though, without having to mess about with modifiers and what-not, and I thought that since we have all these funny-shaped dice, why not make use of them? To that end, I decree that the actual die rolled for surprise will depend on the character class, species, and possibly level. The default die remains the d6. And so on, up to a d30 (if you own one of those things, which I don't). 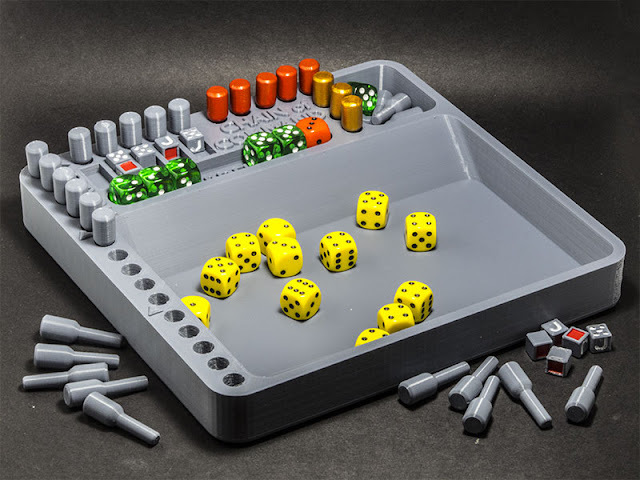 It doesn't use the whole range of funny-shaped dice. At the moment this is all theoretical, and hasn't been tested in actual play, but I think it could be a goer. 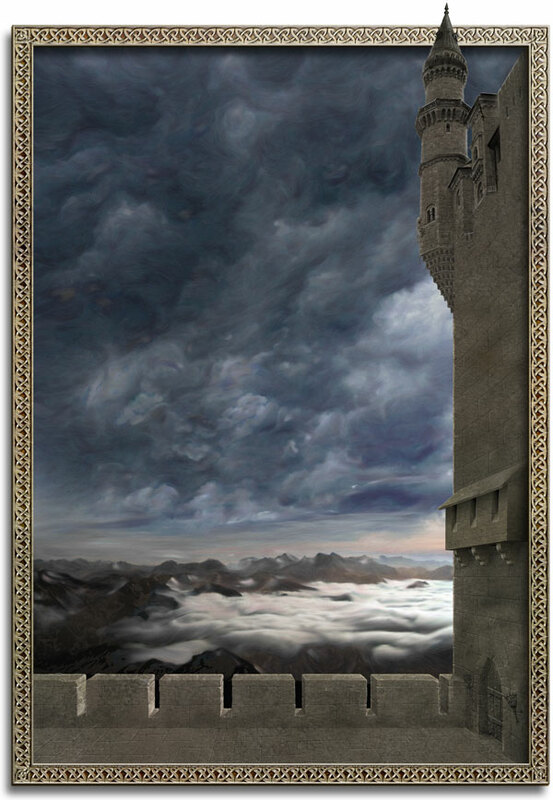 This is a promo image I did for the UK release of Helen Lowe's "The Heir of Night", the first book in her "Wall of Night" series. The posters, postcards and what-not have an image of the book cover in the top left quadrant, and text covering much of the rest, so there's not a lot of detail in most of it. Apart from some very brief blocking sketches, this one is entirely digital, produced in Photoshop and Painter with a little help from CorelDraw. Image may be clickified to embiggenate.